Totally portable–take your Swing Case & content for work or play. 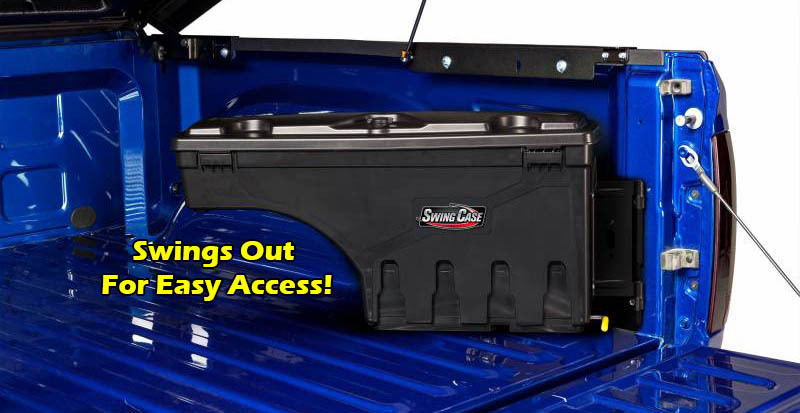 A versatile tool box even with cup holders–you may find your own convenient use for! The UnderCover Swing Case–the only swinging, removable, portable utility case for trucks on the market. Swing Away, Work or Play! New from UnderCover! Lightweight–made of the same rugged UnderCover® Tonneau ABS material. GMC Sierra owners, please note the drivers-side SwingCase will not fit if your Sierra has the integrated tailgate step and grab handle. Passenger-side works fine. Please note, the SC104 will only fit in the NEW BODY STYLE. Some 2019 Silverado's and Sierra's are still being sold with the "Classic" body style. If you have a 2019 WITHOUT the new body style, you will need the SC100. Please be sure of which body style you have before placing your order.